Blooming orchids look so ethereal that it’s hard to believe you can grow them inside your home. For success, choose the right one for your conditions, then watch them flourish. Low light is usually a limited northern exposure or any exposure where the light is blocked by an overhang, trees, or neighboring buildings. Jewel Orchids grow in low light. Anyone who has ever watered an orchid knows that most of what you pour in runs out almost immediately through the bottom of the pot. Because orchids are potted in bark mix rather than potting soil, they need to be watered differently. The goal is to get each mix particle to absorb as much water as possible. To give the potting mix enough time to absorb water, place the entire pot in a bowl of water for 10 to 15 minutes, then lift it out and let the excess water drain before putting the pot back in place. This technique works well for orchids potted in clay. Since clay is porous, water penetrates the walls of the pot and is absorbed by the bark. If your orchid is potted in plastic, place it in an empty bowl, then add water. If you place the plastic pot in an already full bowl of water, the water will push the bark up and out, floating it away from the orchid roots. In this case, add water to just below the lip of the pot and let it sit for 10 to 15 minutes, then drain and return the orchid pot to its place. If an orchid is potted in long-grain sphagnum moss or soilless mix, you can water until water runs out into the saucer below. However, sphagnum moss may feel dry on its surface while the interior may still be moist. Stick your finger an inch or two down into the moss to feel whether it’s truly dry. The kind of orchid: Is it drought-resistant or not? The kind of pot: Porous pots dry out faster than nonporous pots. The kind of potting mix: Sphagnum moss needs water less frequently than bark mix. The air temperature: Plants dry out faster in warmer temperatures. The humidity: Plants dry out faster in drier air. The light: Plants growing in higher light need more water. 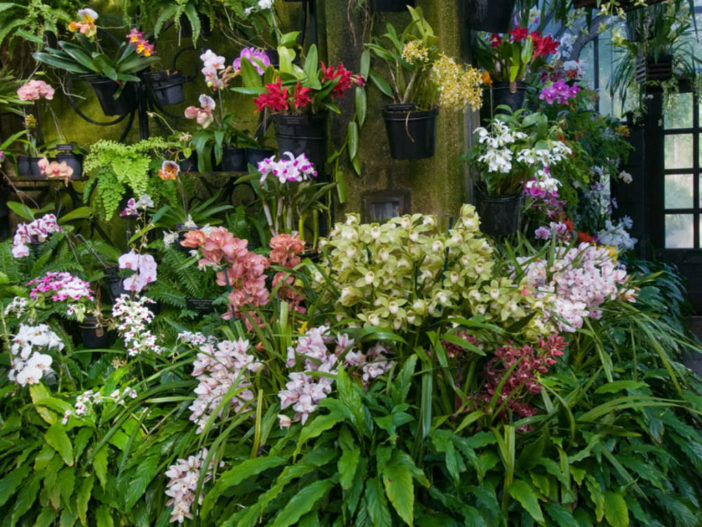 In general, water drought-tolerant orchids, such as Cattleyas, Oncidiums, and Dendrobiums once a week. Water most others, such as Miltonias, Paphiopedilums, and Phragmipediums every 4 to 5 days. Start there, and adjust up or down according to the conditions in your home. Water orchids thoroughly each time, then let them dry out before watering again. Most orchids are not heavy feeders. Many orchids bloom year after year with no fertilizer at all. During active growth, when new leaves are being produced, you may fertilize every other time you water at half the strength recommended on the fertilizer package. However, it’s important to deliver water without fertilizer at least once a month to flush excess fertilizer salts from the bark mix and avoid fertilizer burn to the roots.